Are these the BlackBerry phones for 2009? 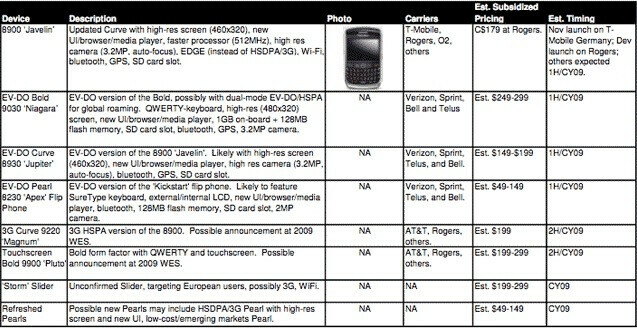 A leaked blueprint showing some of the phones expected to be released next year by RIM show changes being made to current models. For example the Bold is expected to be available in a CDMA EV-DO (or EV-DO/HSDPA hybrid) version, which will be called BlackBerry 9030, nicknamed Niagara. Another CDMA models will be the 8930 Jupiter, based on the 8900 Curve and the 8230 Apex, based on the Pearl Flip. Another Bold derivative, the 9900 Pluto keeps the current features of the first 3G BlackBerry and adds a touchscreen along with an updated web browser. The 8900 Curve will have a 3G GSM version as well, the Curve 9220 Magnum. The newly released touchscreen Storm is also due for a possible makeover next year with a version for European release with a slider QWERTY and...gulp...Wi-Fi. There is also mention of refreshed Pearls, with high-res displays and new UI. Until RIM makes definitive announcements, this is all just speculation. Cross your fingers, as there are models for all of the major U.S. carriers, as well as for Canada and Europe. I really hope Sprint gets 1 of these Blackberry. Cmon Sprint step it up. They have Sprint listed getting three BlackBerries on there... Anyway, I'm looking forward to the EVDO Bold! yeah i wanted the bold with the touchscreen but oh well. i take the niagra. C'mon.... really? I'd rather buy an AT&T Go Phone than purchase a T-Maybe 3G BB. Anyway, I bet the Storm slider's too heavy... I think it's kinda silly. The WHOLE point of the Storm was having a full touchscreen.... very few buttons. Now it's looking like an HTC product. I guess we'll see.